If someone breaches a contract with me, how long do I have to file a lawsuit before my claims are barred by the statute of limitations? In Tennessee, as a general rule, most contract suits must be commenced within six (6) years of the date the "cause of action accrues" or else they will be barred by the statute of limitations. 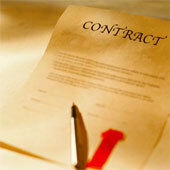 Generally speaking, a cause of action in a contract case "accrues" when the contract is breached. There are important exceptions to the six year statute of limitations, and a contract may be governed by a shorter statute of limitations which requires a lawsuit to be filed sooner than six years after the breach. You should consult with an attorney in order to determine whether your breach of contract case may be governed by a statute of limitations shorter than six years. One exception to the six year statute of limitations for breach of contract suits is the four (4) year statute of limitations of the Uniform Commercial Code. That statute requires that a suit for the breach of a contract for the sale of goods must be filed within four (4) years after the breach of contract. Another exception to the six (6) year statute of limitations for breach of contract suits is the ten (10) year statute of limitations applicable to demand notes. Moreover, parties should be aware that some contracts and agreements contain provisions limiting the time within which a lawsuit can be filed by the parties. Such provisions are typically enforceable, and may require a party to file suit well before the time required by a legislatively enacted statute of limitations. When you have a cause of action for breach of contract, you may also have other legal causes of action arising out of the same transaction or occurrence. For example, in addition to a legal cause of action for breach of contract, you may also have legal causes of action for misrepresentation, interference with contract, or violations of the Tennessee Consumer Protection Act. The statutes of limitations applicable to some legal causes of action can require that a party file a lawsuit within one year from the time their cause of action accrued. Therefore, if you believe that you have legal claims against another party, you should consult with a lawyer promptly so that you can ensure that you don't lose any of your causes of action because of a statute of limitations. Statutes of limitations are unforgiving, and there are very few situations in which a court will extend a statute of limitations for a party.